The degree to which Manitoba's enduring features are adequately, moderately, partially, and not represented are shown in our series of Ecoregion Representation maps by year. Manitoba's Ecoregions are broad areas that share similarities in geography, climate and vegetation. Protected Areas are to be identified and created in each of Manitoba's 16 ecoregions. 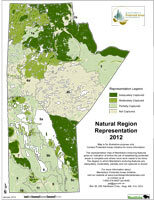 *For the 2013 reporting year, Manitoba will begin reporting on the level of representation in its protected areas network by ecoregion rather than by natural region to match reporting criteria used across Canada.